That which we measure, we attend to. That which we attend to, we improve. This hack provides a framework for measuring consciousness in individuals, groups, organizations and larger systems, and a description of an online, social network game for engaging people in actively developing consciousness across these four levels. These two building blocks will help us shift attention from easy-to-measure, short-term financial metrics towards that which really matters: Reaching higher levels of consciousness, which will lead to organizations that redistribute power, unleash human capabilities and foster renewal. Lastly, the hack describes a management experiment that would test the hypotheses presented, including the claim that developing consciousness will lead to higher performing individuals and teams. 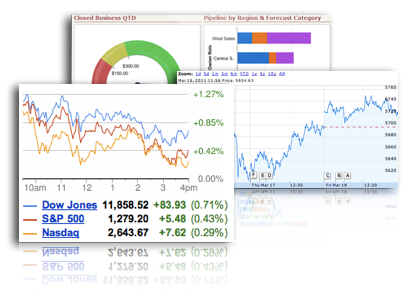 The value of tracking key performance indicators was proven long ago. Once you measure a particular indicator it receives attention and drives behavior. The fact that results of measurement are such attention grabbers explains why individuals and organizations today so often are enslaved to easy-to-quantify, short-term financial metrics: We can wake up every morning and look up our stock price on Google, our cash balance in SAP, our sales figures in Salesforce.com etc., all whilst pretending to have breakfast with the family. As the CEO of a software company, the metrics I presented and discussed at monthly meetings of the Board of Directors had a crucial effect on behavior between meetings, as I knew what the ramifications would be if revenue was too low or the outstanding payments too high. We focused all our attention on short-term, fluctuating financial metrics. We became what we measured. Today, it is my strong belief that had we been conscious of the need, and had the means, to develop ourselves, our teams and the organization as a whole, we would have provided better products to our customers and a higher return to shareholders. It is for this reason I set out on this journey to create a metric that would provide balance to those already in place. A metric that would capture and redirect, at least an appropriate share of, our attention to becoming better individuals, teams, organization and societies. A journey that has changed who I am and who I can become. As the CEO of a software company, the metrics I presented and discussed at monthly meetings of the Board of Directors had a crucial effect on behavior between meetings, as we knew what the ramifications would be if revenue was too low or the outstanding payments too high. We focused all our attention on short-term, fluctuating financial metrics. In turn we became reactive and short-term focused at the expense of taking care of ourselves and each other. Today, it is my strong belief that had we balanced those short-term metrics with a longer term focus on developing ourselves, our teams and the organization as a whole, we would have enjoyed work more, provided better products to our customers and offered a higher return to shareholders. It is for this reason I am on this journey to create a supermetric that will redirect, at least an appropriate share of, our attention to becoming better individuals, teams, organization and societies through focusing on developing our consciousness. Let us use the fact that we are compelled to improve what we measure by measuring that which is important: The level of consciousness at which we as individuals, as well as the groups, organizations and systems we work within, operate at, and how much effort we apply to developing it further. This question is already being answered as part of my master's thesis at MIT's Sloan School of Management, supervised by Dr Otto Scharmer, and is outlined below. As part of this thesis I am developing a framework that defines the different modes of operating for each type of entity (individual, group, organization and system), the capacities required to operate in each mode, as well as an approach to assessing and directing attention to the development of consciousness. Below, I will go into detail on the group level of the framework in order to provide a more focused, in-depth explanation that sets the scene for the management experiment that I propose under 'First Steps.' A focus on groups seems most appropriate because a) they are often overlooked as leadership development tends to focus on the individual and b) experiments at the institutional or system level would likely have to run over more than 1 year to have measurable impact. Other parts of the framework are included at the end of the section for reference and context. The definitions of levels of group consciousness below should clarify the potential outcome and indeed the business case for raising consciousness at the group level: Raising consciousness will cultivate groups that can face facts, adapt to change, engage deeply with clients and deliver profound, innovative solutions, as touched on in the recent McKinsey Quarterly article 'Sparking creativity in teams: An executive's guide.' 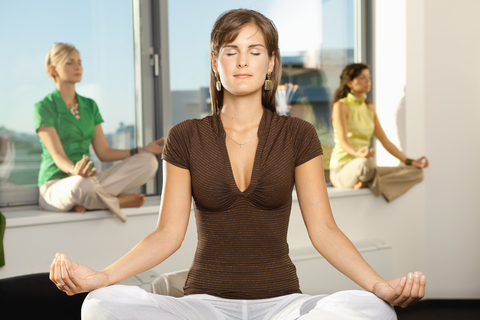 A focus on groups inevitable leads to development of the individuals in the group as well, which would have positive effects as well: A recent study at Massachusetts General Hospital shows that meditation, a common practice in development of consciousness, leads to physiological changes in areas of the brain related to learning and memory, stress, self-awareness, compassion and introspection. We will not define consciousness itself. Instead we simply agree that it is a) non-local and b) expresses itself in the individual through a greater sense of connectedness. Non-locality means that consciousness is not local to the brain of individual beings. Instead, consciousness resides in a shared field that interconnects all beings. It follows from the above, that operating at a higher level of consciousness will express itself as a richer, deeper connection between the individual, group, institution or system, and their context. Based in this, we define the 4 modes of conversing for groups as shown below. The videos provide a basic (and hopefully entertaining!) illustration of each mode. The ‘conforming’ group is a polite, protocol following group in which individuals engage cautiously to avoid conflict out of fear of repercussions that could hurt them individually. Dominance of explicit or implicit protocols and absence of open expression of individual opinions are telltale signs. The ‘confronting’ group is a tough talking, debating group in which individuals predominantly engage in promoting and defending their personal viewpoint. Individuals engaging intellectually and strongly identifying with their point of view are trademarks of this type of group. When operating at this level, multiple viewpoints are voiced, typically improving group decision-making compared to the ‘conforming’ group by offering a choice set of possible solutions. The ‘inquiring’ group is an empathic, dialoguing group that predominantly engages in inquiry into the individual viewpoints being expressed to allow the group to reflect on them. A focus on engaging both intellectually and emotionally, and asking questions to clarify statements made by others is typical in this type of group. When operating at this level, a deeper, more objective examination of viewpoints divorced from the identity of individuals typically allows the group to jointly develop a good solution. The ‘presencing’ group is holding space in which members recognize their common ground and connect with a deep sense of shared purpose and understanding of the future that wants to emerge. The ability to engage in stillness, reveal deep personal experiences and engage with the emerging future is typical in this type of group. When operating at this level, the group enables its members to overcome their attachment to their individual identities by creating a shared field, free of individual blockages, in which to engage in discovering and manifesting truly profound solutions. To assess a group, we would employ a combination of self-assessment, questioning the level of competence the group has in specific capacities that relate to the modes of conversing outlined above, and observer feedback on behaviors expressed by the group. Capacity to suspend: When under pressure and confronted with information that calls into question the groupsbeliefs, how competent is the group at suspending conforming and shift into a debate that enables members to voice their opinions openly? Capacity to redirect: When under pressure and faced with a complex situation, how competent is the group at engaging in a dialogue that allows the members to inquire into differences and to see their situation from the whole? 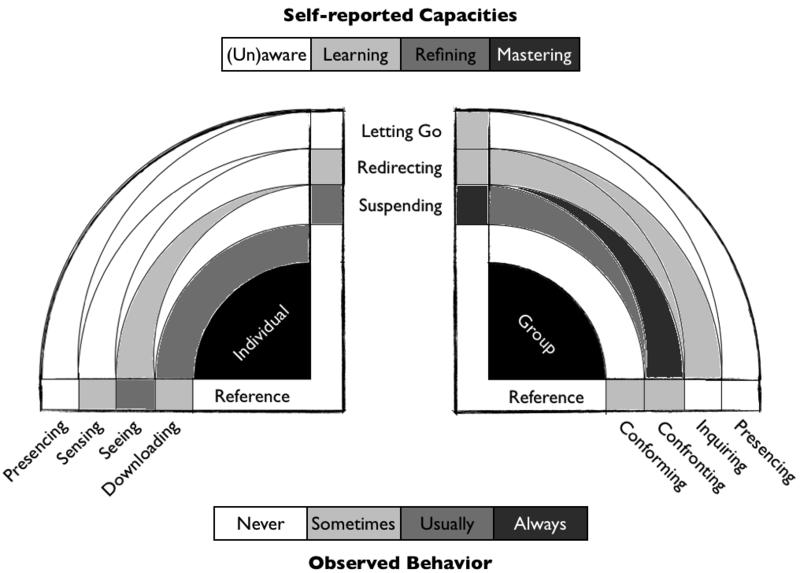 Capacity to let go: When under pressure and affected by change, how competent is the group at providing a holding space for members to let go of past identities and barriers in order to connect to the future that is wanting to emerge? Conforming behavior: When under pressure and confronted with information that calls into question the groups beliefs, is the group paralyzed by the need to conform and therefore unable to take in new views and adapt? Confronting behavior: When under pressure and confronted with information that calls into question the groups beliefs, does this group succeed in making diverging voices heard? Inquiring behavior: When under pressure and faced with a complex situation, does this group engage in a dialogue that allows different views to be articulated, heard and inquired, and to reflect on the situation from the whole? 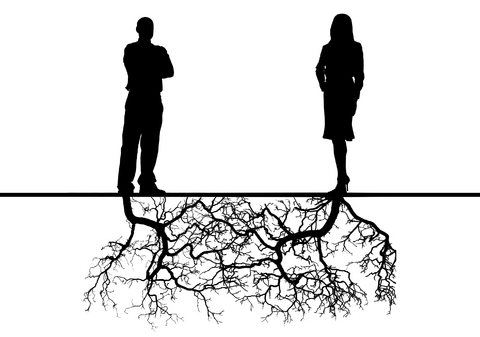 Presencing behavior: When under pressure and affected by change, is this group able to provide a holding space for its members to let go of past identities and barriers, in order to connect to the future that is wanting to emerge? Through this combination of self-assessment of group capacities and external observer feedback on group behaviors, we can visualize group consciousness as shown below. The 'Reference' fields compares this group to a reference, e.g. the average of all groups within an institution. 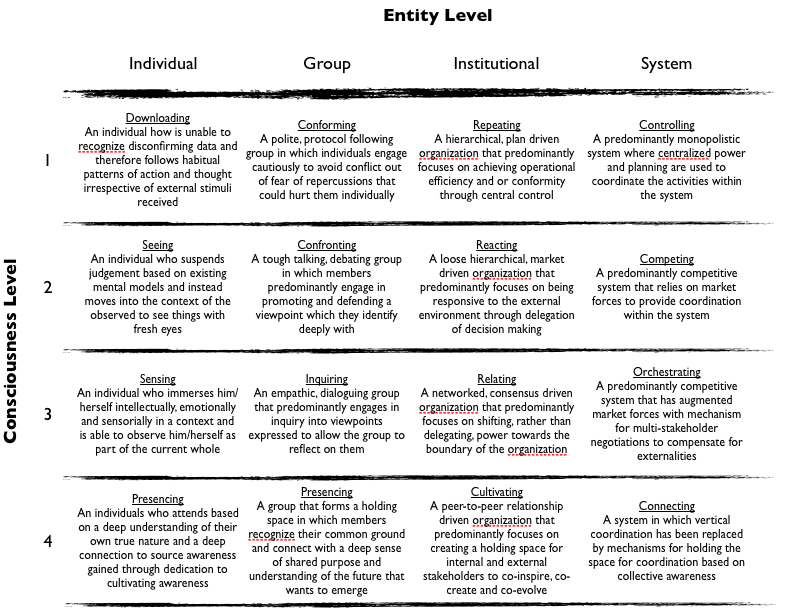 The complete framework includes the individual, group, institutional and system level, as outlined below. One exciting aspect of this framework is that it provides and integrated approach for assessing and developing consciousness at all four levels. The questions used to assess each entity level can be found in the attached Assessing consciousness across the 4 entity levels PDF file. By assessing all individuals and groups within an organization we can visualize how specific individuals and groups compare to the average, as well as how the self reported capacities compare to the observer reported behaviors. Similarly, internal and external stakeholders can assess entire institutions and systems, which can be visualized in the same way. The framework described above, which maps out the levels of consciousness, is in itself an important tool as it provides the language that enables us to explore and discuss what consciousness means from a business perspective. With the framework in place, we turn to creating an engaging approach to stimulating development of consciousness. Here comes the challenge: Directly measuring and providing feedback on increases in consciousness is about as engaging as watching grass grow. Furthermore, we have learnt from experiments that having people assess themselves and each other requires that they have already had a fair amount of exposure to concepts in personal, group and organization development, an assumption we do not want to make here. The solutions is simple: Gamification. By implementing a social network game that encourages as well as tracks effort applied to development of consciousness, we can create an engaging environment for everyone. Jim gets into the office at 6:40am, logs into his computer and receives an email from The Field reminding him that he has not yet completed his list of 3 insights gained from reading Robert Kegan's 'Immunity to Change'. Jim had chosen that book as his 'Monthly Read' and was only a couple of pages away from completing it. He digs it out of his bag, reads the last few pages and spends 15 minutes contemplating the relevant key takeaways. He logs into The Field, hesitates a bit to find the right words, then writes 3 paragraphs that describe what he learnt from the book. He clicks 'Share' and immediately has 180 'Consciousness Points' added to this month's score. He checks the stats for himself and his team and is pleased to see that he now is in 2nd place within his company, but more importantly his team is now 10 points over the monthly requirement, which means that this month there will be no reminders from their manager that they are slacking off on their personal development. Meanwhile, Sarah is deep into her daily 20-minute meditation session in the company's boardroom, which has been reserved for this purpose daily between 6am and 9am. At her last monthly meeting with her mentor, they decided she should try out a new technique and she has made great progress since. Because of this daily practice she has been able to reduce her stress level significantly by becoming much more centered. As she leaves the conference room to start the day, she quickly logs her mediation session using her iPhone's The Field app so her mentor knows that she is keeping up with the practice. Tom in the meanwhile is calling it a day as he wants to pick the kids up from school today. He is learning that instead of seeking balance between work and life, he needs to go deeper in both areas and avoid the ‘small mind’ thought that one can only come at the expense of the other. 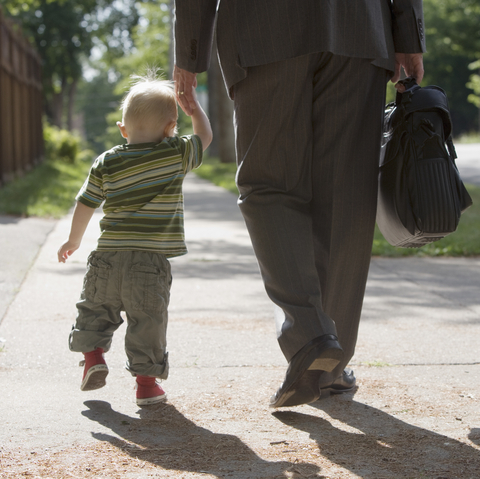 So he set himself the goal of starting 1/2 hour earlier each morning and leaving the office in time to be there when his two boys finish school. His colleagues have been very supportive of this, as they have set similar goals for themselves this month. He makes a mental note to publish public 'thank you' note to Jim in The Field, for sharing the insights from the book he had read. Tom's boss Jane is meanwhile preparing the reports for this months management team meeting. She logs into The Field to print out one of the required reports, the Consciousness Development Effort report, which the management team checks every month to ensure that sufficient effort is being put into personal and group development to ensure that they will meet this years target of raising group consciousness by 10% compared to last year. This reminds her that she needs to schedule the expert assessment for next month. She prints the report, places it in her briefcase with the other reports and decides to go home for dinner. Later that night she makes her daily journal entry in The Field, recording the depth of conversations she had that day, a practice that is getting her to engage more empathetically with her co-workers. With the framework in place, we turn to creating an engaging method for stimulating development of consciousness. Immediately we run into a challenge: Directly measuring and providing feedback on increases in consciousness is about as engaging as watching grass grow. The solutions is simple: Gamification. By implementing a social network 'game' that encourages, tracks and rewards effort applied to development of consciousness, we can create an engaging environment that will draw people in. 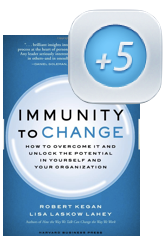 Jim gets into the office at 6:40am, logs into his computer and receives an email from The Field reminding him that he has not yet completed his list of 3 insights gained from reading Robert Kegan's 'Immunity to Change'. Jim had chosen that book as his 'Monthly Read' and was only a couple of pages away from completing it. He digs it out of his bag, reads the last few pages and spends 15 minutes contemplating the relevant key takeaways. He logs into The Field, hesitates a bit to find the right words, then writes 3 paragraphs that describe what he learnt from the book. He clicks 'Share' and immediately has 5 'Consciousness Points' added to this month's score. He checks the stats for himself and his team and is pleased to see that he now is in 2nd place within his company, but more importantly his team is now 2 points over the monthly target, which means that this month there will be no reminders from their manager that they are slacking off on their group development. Meanwhile, Sarah is deep into her daily 20-minute meditation session in the company's boardroom, which has been reserved for this purpose daily between 6am and 9am. At her last monthly meeting with her mentor, they decided she should try out a new technique and she has made great progress since. Because of this daily practice she has been able to reduce her stress level significantly by becoming much more centered. As she leaves the conference room to start the day, she quickly logs her mediation session using her iPhone's The Field app so her mentor knows that she is keeping up with the practice and she gets her Consciousness Point for her effort. It is 2pm and Josh is finishing up a meeting with a colleague from marketing and two clients. As a last request before leaving the meeting room, he asks the clients to anonymously rate how he and his colleague attended during the meeting. The clients quickly clicks on a graphic representing their feedback, and the result gets aggregated into a report available to Josh's mentor. Tom in the meanwhile is calling it a day as he wants to pick up his son from daycare today. He is learning that instead of seeking balance between work and life, he needs to go deeper in both areas and avoid the ‘small mind’ thought that one can only come at the expense of the other. So he set himself the goal of starting 1/2 hour earlier each morning and leaving the office in time to be there when his 1-year old finishes daycare. His colleagues have been very supportive of this, as they have set similar goals for themselves this month. He makes a mental note to publish public 'thank you' note to Jim in The Field, for sharing the insights from the book he had read. Tom's boss Jane is meanwhile preparing the reports for this months management team meeting. 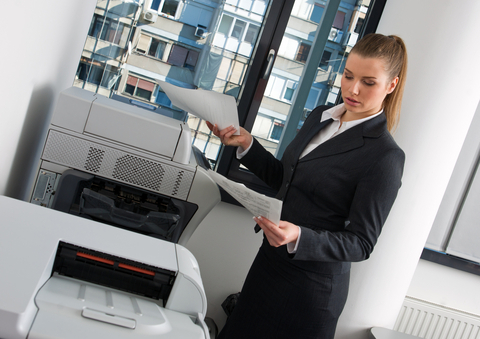 She logs into The Field to print out one of the required reports, the Consciousness Development Effort report, which the management team checks every month to ensure that sufficient effort is being put into personal and group development to ensure that they will meet this years target of raising group consciousness by 10% compared to last year. This reminds her that she needs to schedule the expert assessment for next month. She prints the report, places it in her briefcase with the other reports and decides to go home for dinner. Later that night she makes her daily journal entry in The Field, reflecting on the depth of conversations she had that day, a practice that is getting her to engage more empathetically with her co-workers. 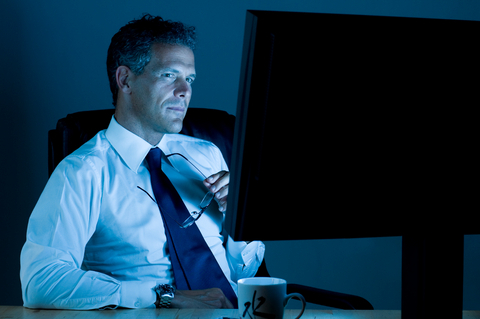 Jim, the new CEO, is burning the midnight oil considering how the increased consciousness within the organization can best be utilized in a reorganization he is planning. The work with individuals and groups has really had a dramatic impact on engagement at work and he wants to make sure that this has an impact at the organizational level as well as the company currently is ranked in the quite low in The Field's ranking of institutions. This is raising concerns with prospective employees and investors alike. A glance at the description of the next level of consciousness that he wants the organization to reach gives him the answer: He will work with senior management to create 3 different reorganization options and then have all employees comment on and vote for which option they think is most likely to achieve the goal of increased innovation. He makes a note to check with his colleagues if The Field can handle public voting on initiatives such as this one. A more detailed outline of the elements of The Field can be found in the document The Field - Outline.pdf. A fledgling implementation of The Field is evolving here. It is entirely plausible that adoption of the social network game approach outlined above starts as a grassroots movement within a larger organization rather than being implemented top-down. Either way, integrating development of consciousness into existing management processes is key to unleashing its true potential and therefore highly recommended. As a measurement, it enables a holistic set of developmental targets to be set and progress to be evaluated. It should therefore be used in processes ranging from strategic planning to individual performance reviews. As a framework, it enables a rich set of discussions at different levels of the organization, whilst painting a clear picture of the journey ahead. It should therefore be integrated into organizational and personal development processes. As a learning tool, it enables a variety of practices to be brought into the organization, which in turn allows it to be used as a mechanism for disseminating best practices across organizations. It should therefore be integrated into existing learning and leadership development processes. The solution outlined provides a very practical approach to drawing our attention to development of our consciousness over the long term, a topic which often is only within reach of enlightened senior executives and spiritual leaders. It sets the stage for democratizing personal, group, organizational and societal development. 3) By evolving people and groups, we enable whole organizations and systems to evolve also, moving towards a world of ecosystems that offer freedom to flourish while generating and capturing value in a sustainable fashion. Having set the scene, let us now define a very concrete, innovative management experiment that would prove that the ideas discussed above in fact would have the impact we are looking for. We want to go beyond working with individuals, as much attention is already being paid to that through traditional performance reviews etc. *It should be noted that since groups consist of individuals, the experiment will necessarily involve engaging individuals in their personal development also. We believe that a root cause of groups a) not performing at capacity and b) not providing a supportive, low stress, compassionate environment for individuals is that too little emphasis is placed on developing consciousness at the individual and group level. As we need to control for a significant number of external factors over the duration of the experiment it is important that the experiment is run on a sufficiently large population and includes a control group. Within the context of an organization such as HCL, we would focus on working with account teams since the large number of account teams would ensure that we get enough volunteers for the experiment. Out of the set of teams who volunteer, half will randomly be placed in the control group. In case the number of volunteering teams is small, some care will be taken to ensure that the two groups are demographically similar. The comparison between these metrics will be used to draw conclusions about the outcome of the experiment. The assessment of pre- and post consciousness levels by observation will be captured on video tape. This will include interviews of the individuals as well observations of groups in their regular environment. A team of coaches assess individual and team consciousness through videotaped interviews and observations of the individuals and teams. Throughout the month the participants will engage in the practice and activities they have chosen in order to reach the goals they set. Communication with the coach will be facilitated through the social network game. The baseline and final assessments, along with data from the social network game will be analyzed to establish whether the hypotheses have been confirmed by the experiment. A report will be written and its conclusions presented to management at HCL and disseminated through the Management Innovation Exchange. The following would be required to run the experiment. Estimates of time required for each is based on team sizes of 4-6 people. I would like to thank Otto Scharmer, Rob Mallick, Thomas Malone, Edgar Schein, Tracy Purinton and John P. Milton for their teachings and conversations, which have provided me with a strong foundation to based my work on. In particular Otto Scharmer's 'Theory U' has been instrumental by providing a strong theoretical framework for much of the work I have done. A special thank you goes out to Michele Zanini, who was appointed as my mentor for this hack and who provided me with excellent feedback. Last but not least, I must thank my wife and kids for letting me 'burn the midnight oil' leading up to the deadline, without their support this would not have been possible! While working in different organization then we should be more aware of the different working conditions of the organizations. There are different people those who are working under different organization and would try to reinvent the means of control, make directions setting bottom up and outside in. This would also redefine the work of leadership. 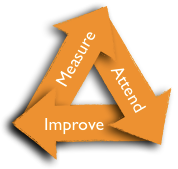 In order to be a successful organization we should mainly consider the three attributes such as measure, attend, and improve. By looking into these three attributes we can definitely be successful.